Hair removal products comes in all different types of machinery or products. However, very few of them use the method by which the Verseo ePen removes hair. The Verseo ePen uses electrolysis technology to remove the hair from people’s skin, with somewhat mixed results. As far as I’ve seen, the ePen is one of the most inexpensive electrolysis-style machines on sale. It only costs about $58. It operates in the same manner as an electrolysis treatment. The person must first apply the conductive gel onto the area of skin that they want to remove the hair from. 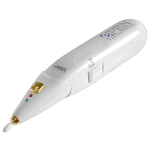 The gel helps the electrical current of the machine to reach the root of the hair follicle. The person can then apply the ePen onto the area. The electricity will damage the hair’s root, permanently keeping the hair from growing again. After a person treats the area with the pen, he or she can use a tweezer pluck the hair out of the follicle. The person could also rub the hair off with his or her hands. The person the repeats the process for all the other hairs that he or she wants to remove. If the person is trying to treat a large area, such as the legs, then he or she can use the conductive body pads provided in the package. The ePen is painless when compared to other methods of electrolysis. Although it may take a few presses with the ePen to remove the hair, it doesn’t cause any significant pain. This is a good solution for people who are looking for an inexpensive way to remove their hair permanently. Although the ePen is very reasonably priced, the quality of the product isn’t quite up to par. The ePen isn’t suitable for people who want quick results. The entire process requires people to follow the directions exactly without taking shortcuts. For many people who purchased the product, this entire procedure took too long for their liking. To make matters worse, the ePen doesn’t always work when people want it to work. Customers often complained that they have to use the pen numerous times just to remove some of the hair from their skin. In many cases, the ePen procedure is a hit-or-miss process. Even though it is painless, it probably takes more time than is really needed from an electrolysis machine. Perhaps Verseo ran out of money to develop decent equipment parts in the ePen. Whatever the case, the ePen simply isn’t worth the $58 that people pay to buy it. If anyone really needs a more permanent solution, they can just purchase an epilator to uproot the hairs mechanically. The ePen is a time-wasting product that Verseo should have fixed before they started selling it.